THE BRITISH RAILWAY STORIES LTD: "Thompson A2/2, Gresley A4, and Copley Hill's Demise..."
"Thompson A2/2, Gresley A4, and Copley Hill's Demise..."
We will start with the latter. 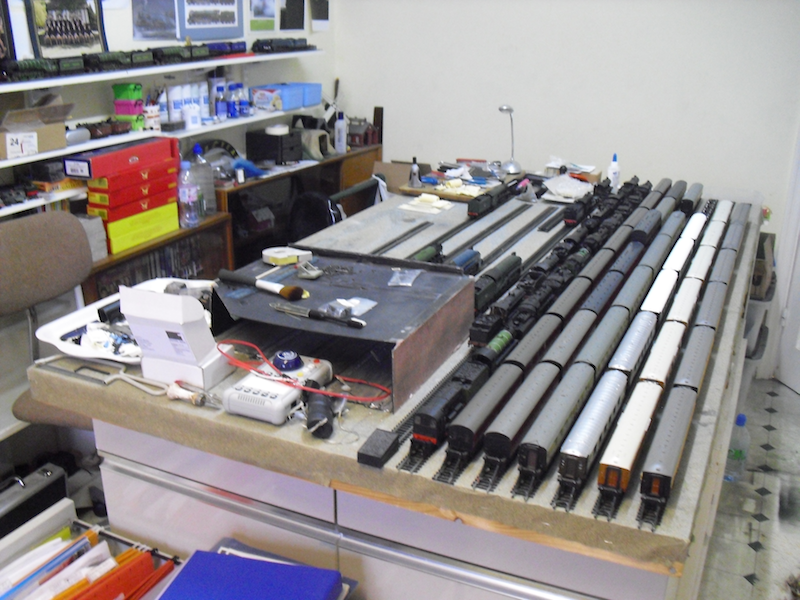 I am planning a new layout, on which I can start to actually run my collection of locomotives and rolling stock, so Copley Hill's demise was assured really. I needed the space for a workbench on which to build my models, paint and weather them, and whilst the Copley Hill set was a poor trainset, it works very well as storage and a workbench (see above). I've retained the shed for the purposes of photographing my collection and modelling, but all of the points, curves and similar have gone. All running in will be done on my trusty rolling road from now on. So is this the end of my association with Copley Hill? No, merely a slumber until I can build the next incarnation of the shed...! Here's a model which has proved camera-shy. I originally finished this model last July, but never got around to blogging it, in no small part due to job worries and concentrating on selling my eBook. 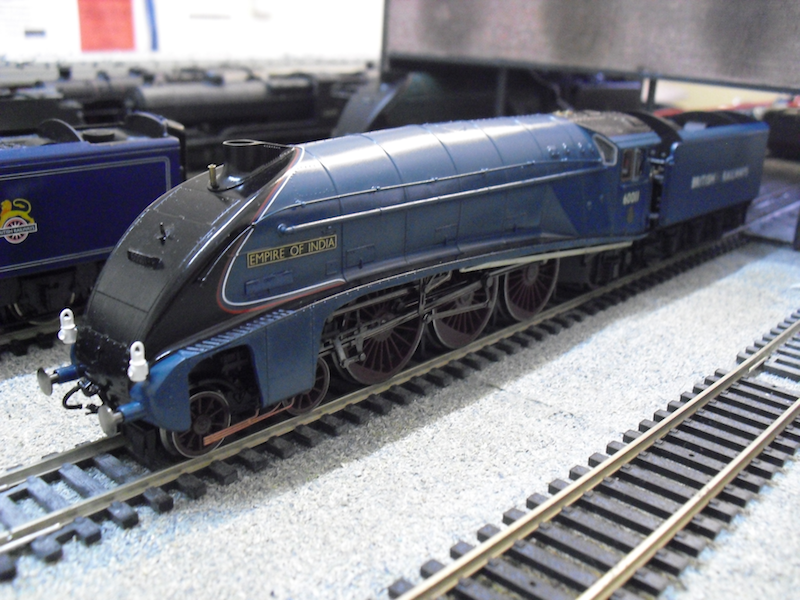 60011 Empire of India is also my joint entry with Peter Harvey, which uses his superb etches to create a model which Hornby have never offered; a garter blue A4 in British Railways branding. The modelling of this A4 is described in further detail here. There is another A2/2 on RMweb which by far out strips the modelling of my own; in my defense, I'm neither as experienced or talented and thus this result is the best I can muster for the moment. Lessons to learn most certainly. 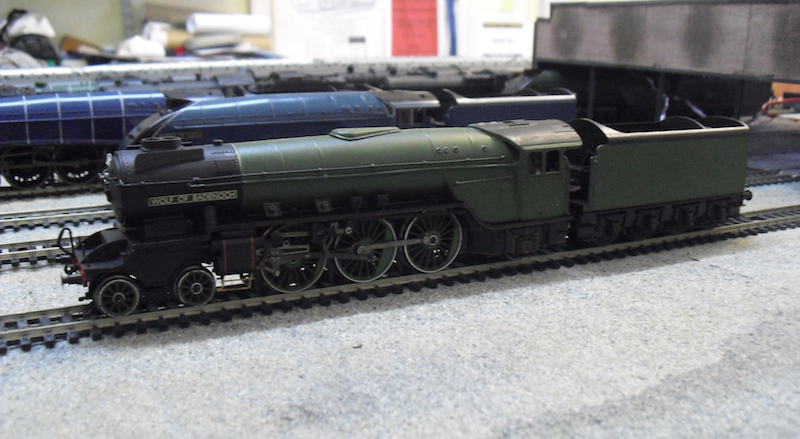 60506 has had a white primer applied, and then Railmatch apple green on top; but the colour is much darker than I had anticipated and I am currently um'ing and ah'ing over whether to strip it all away and start again with the painting. 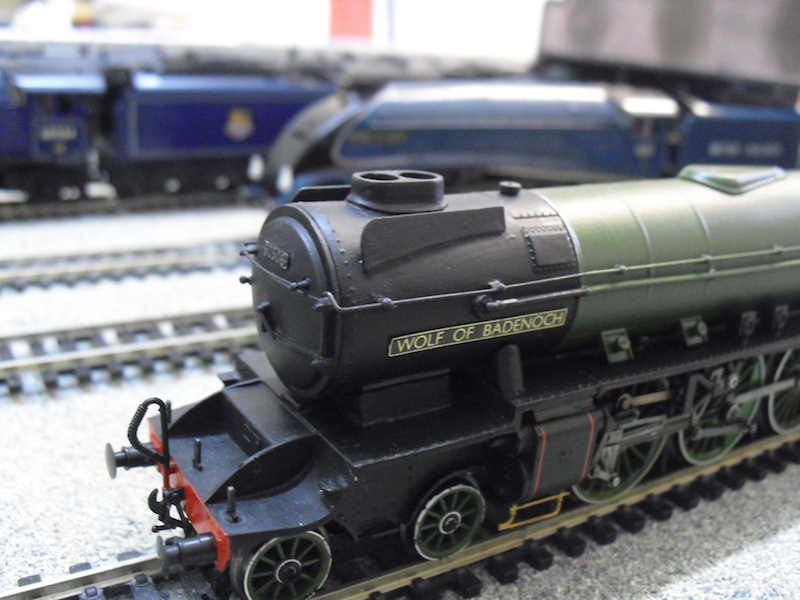 It is particularly aggravating as it is probably the smoothest finish I have ever achieved on any locomotive I have painted myself. 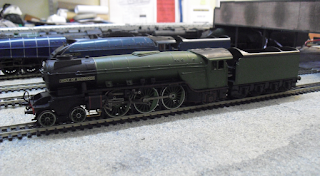 One point of detail - none of the A2/2s had the half round beading on the chimney in 1949, therefore I removed the beading on mine with a wet'n'dry sanding pad. 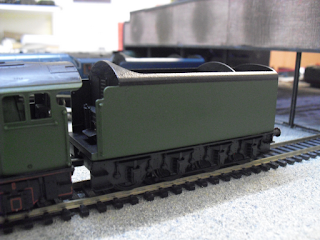 The tender has also been painted, coming out in the same dark shade as the locomotive. White undercoat I thought made top coats lighter. I am wondering if a few coats of Johnson's Klear will change the shade for the better. It will need a coat of Klear anyway to allow the waterslide transfers to sit properly. That's it for the moment until my latest short term contract for work is completed. See you in November...! Speaking of which, would it be exhibition standard? That A2/2 is just a rebuilt V2 right? No, it's a rebuilt P2. There is no such thing as a "rebuilt V2". The A2/1s (the ones you are thinking of) were built from stock V2 parts, but were never V2s in the first place. Ah ok, it's a Shame the P2's were rebuilt. But that engine does look good! Nice A4. I like the lettering. 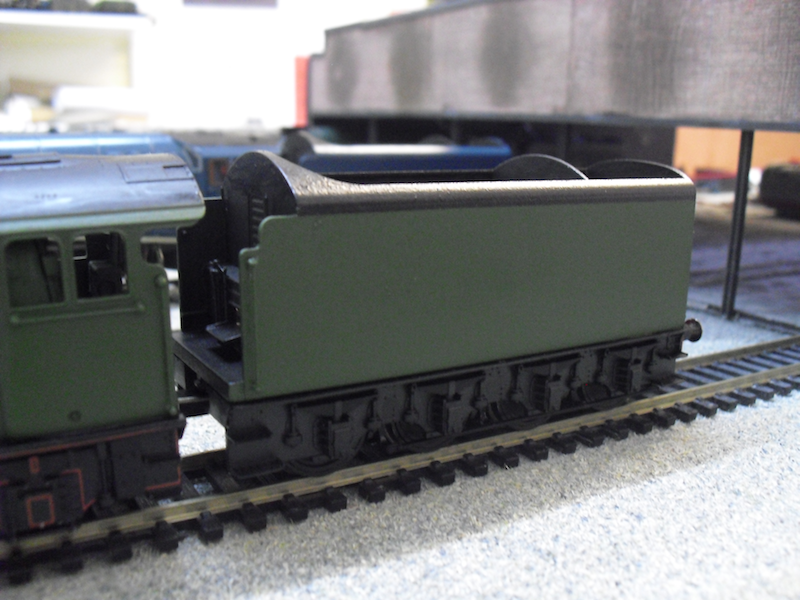 "Murdering a Bachmann V2...Thompson A2/1"
"Thompson A2/1 from a V2?" 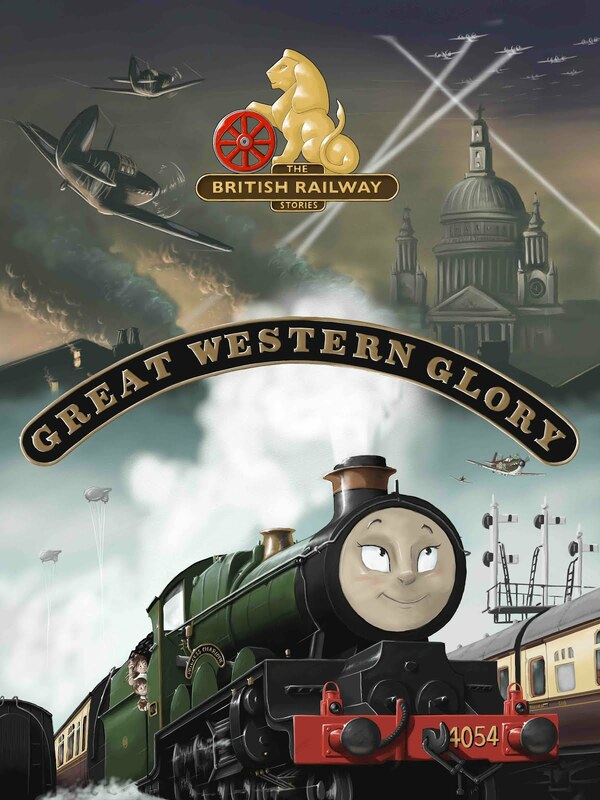 "The British Railway Stories & EG Media Team Up"
"Tale of the Unnamed Engine - Now on Kobo!"